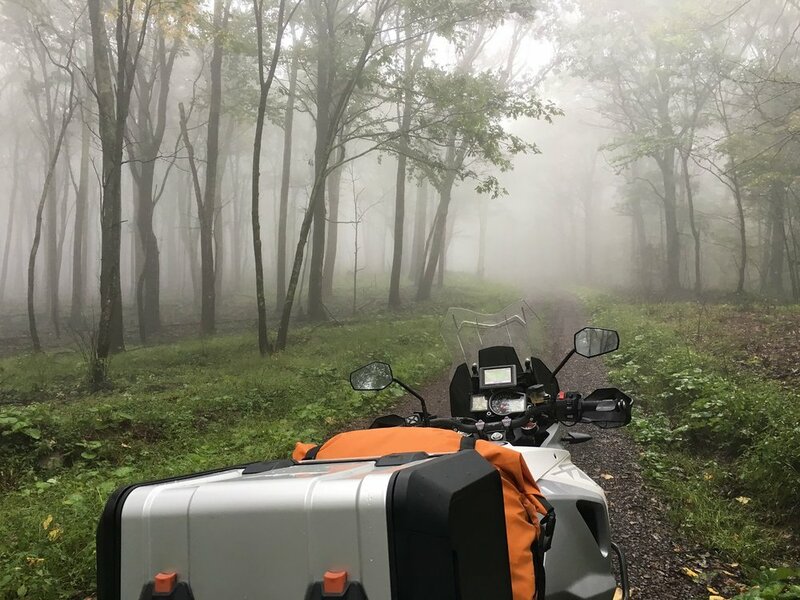 When the maps and tracks for the Mid Atlantic Backcountry Discovery Route were released this spring, trip planning became the main subject of our Happy Hours as we gathered and waited for the riding season to begin. It is a bit ironic that it took us almost the entire season to actually make this happen, but here we are. On the eve of our departure, Mother Nature is washing the roads for us! Lets just hope she is not washing them out. Florence took her shot at the Carolina Coast too. I think this is going to be a moist BDR ride, even up on the spine of Virginia. 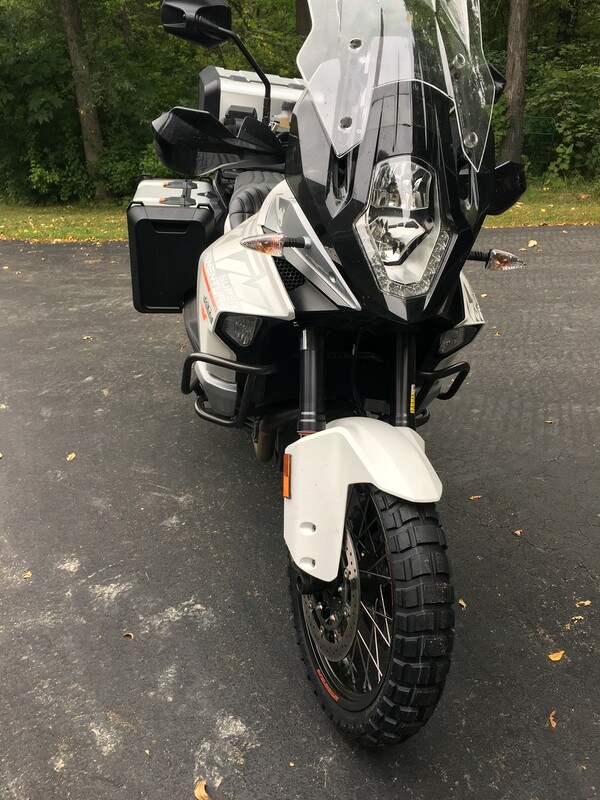 Four of us will be leaving Ithaca NY in the morning, riding down to Damascus VA and then riding the MA BDR south to north. 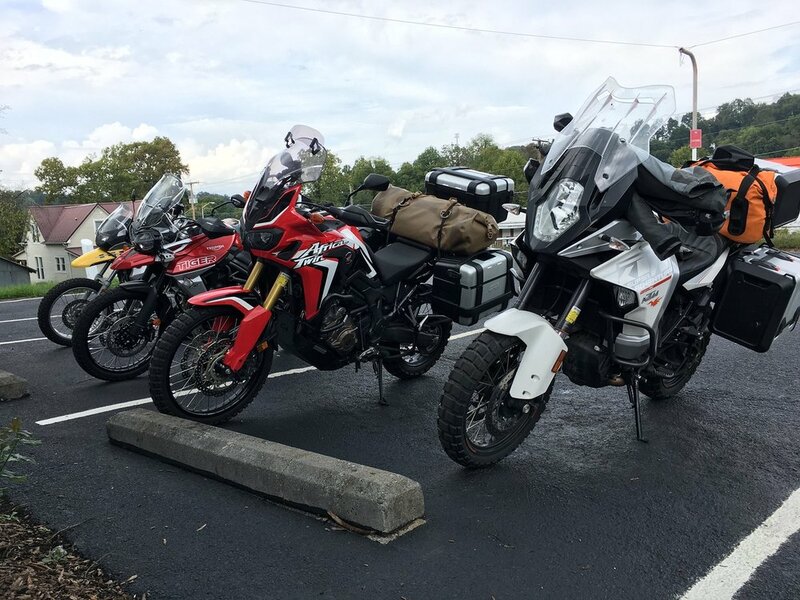 We are on a BMW F650GS, a Honda Africa Twin, a Triumph Tiger 800 XCa, and a KTM 1290 Super Adventure. Come ride along with Greg, Doug, Seth and Rob. The GS a set of engine guards and K60 Scouts. They are pretty stiff, but went on with a bit of grunting and sworking. 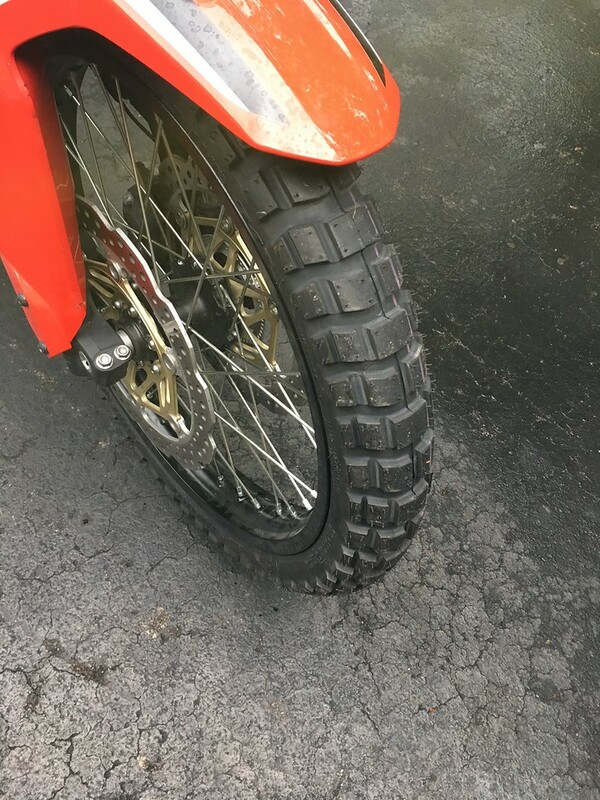 The Tiger 800 XCa has a set of Pirelli Scorpion Rally knobs. I said goodbye to my sweetie Briar Rose and she snapped this before I headed out. Headed down to Gimme Coffee and met up with Greg, Doug and Seth. Greg and Doug were already there. We arrived in Staunton VA for the night and parked the steeds. A good day of riding so far. 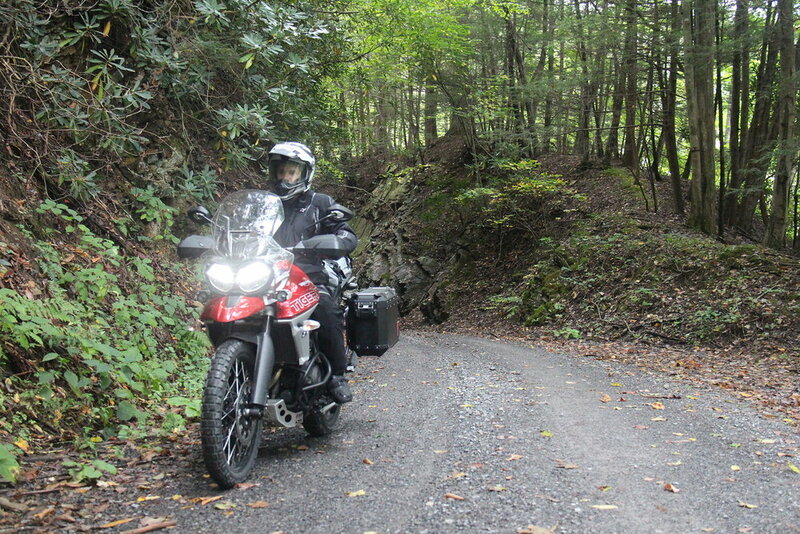 About 420 miles with mostly overcast skies, some sunshine, some rain, some wind and no issues at all. Great riding with this group. We got our rooms, relaxed and shared some tequila and rye and headed across the parking lot to the Waffle House for what turned out to be a great dinner. Charging our devices, talking to sweethearts and getting ready for what looks like a wet day tomorrow. There is no place I would rather be. 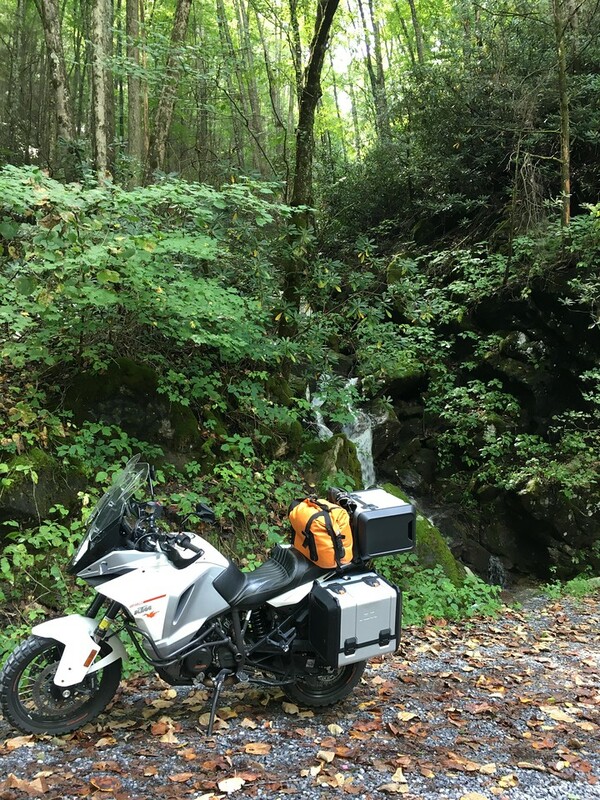 Rode from Staunton to Damascus on Sunday morning and got to Cowboy's in time for lunch. They are back open now and you should have some fried chicken. Cowboys is right at the start of the MA BDR, 3rd and Douglas. Stopped the BDR for the day in Bland VA, and headed down to Wytheville to get a room and some dinner. 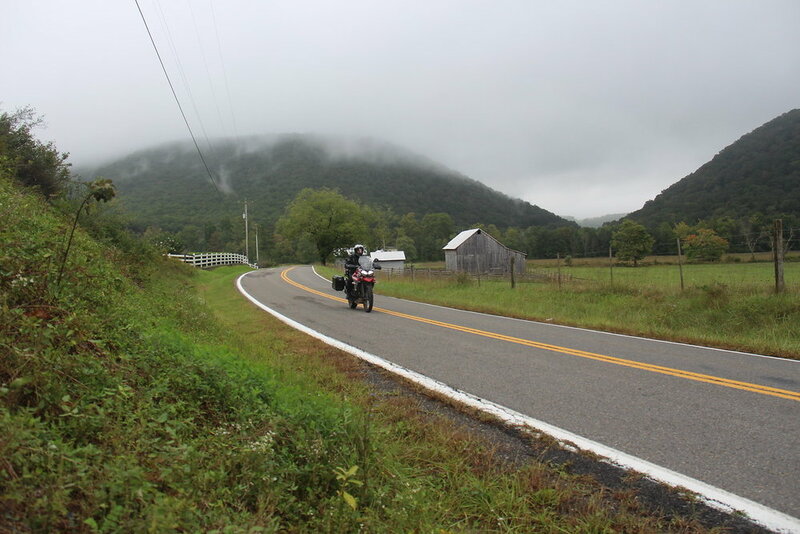 Great day of riding, weather was not too bad, we had some rain, but rode in overcast skies with some sunshine for most of the day. Had dinner at El Puerto and really enjoyed it. Great food, great margaritas and a fun waiter with a sense of humor. Nice way to end the day. We picked back up this morning after a hearty breakfast at the Waffle House in Wytheville. It was a short run back up 77 to Bland where we picked up the trail again and headed up into the hills. The dirt section between Bland and Eggleston was lots of fun with a few muddy challenging sections. Light rain, heavy fog and no dust on the dirt roads! Aside from on hairy moment trying to circumnavigate a mudhole where both Doug and I almost went swimming, it was relatively smooth going. Fully loaded ADV bikes in the mud are a handful. Seems a better approach would have been to go through the center of this large mud hole instead of skirting it. I am sure we will get more opportunities. 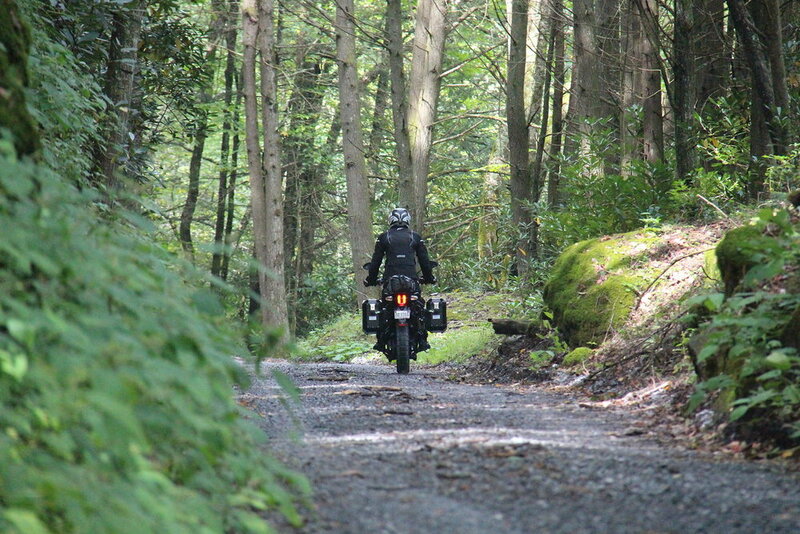 We stopped to take some pictures at the bottom of Dismal Creek road, near Trent's Grocery and met Joe Carr. This was his wife's grandfather's house, built 9 years before the civil war. Beautiful Gap Farm. Had a great conversation and exchanged info. So nice to meet folks down here and learn a bit about their life, history, family, etc. Love how friendly everyone is. They definitely know about all the bikes going by and seem pleased with it. The fog was with us pretty constantly.